growing up, on occasion my mom would make chocolate waffles. they were always such a special treat. my mom had a tiny little square waffle cookbook that was filled with the most delicious waffle recipes. the pages were well worn and had bits of waffle batter splattered on them from years of love. on a weekend morning, we would gather around the kitchen counter to make the chocolate waffle batter, still half asleep, and then watch as the waffles cooked in her trusty heart-shaped waffle iron. when the waffles were done, the waffle iron would let out the loudest beeping noise. we would try to quiet it any way that we could so that it didn't wake my dad who was still asleep upstairs. let me tell you, that heart-shaped waffle iron sure got a workout over the years. i miss that waffle maker, and i miss those weekend mornings. so, moral of the story . 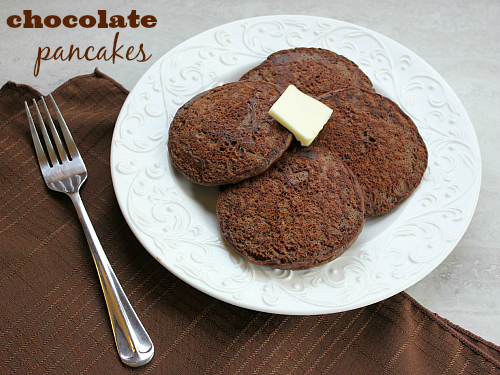 . . if chocolate waffles are mom approved, why not chocolate pancakes? chocolate for breakfast?! i know what you're thinking, but listen, this recipe is essentially just a basic pancake recipe with 2 tablespoons of unsweetened cocoa powder added to it. it's amazing what 2 tablespoons of cocoa powder can do to pancakes. 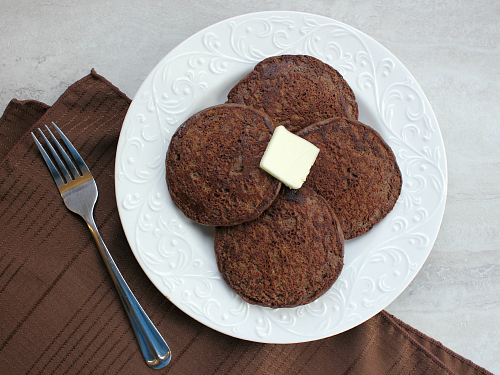 the chocolate flavor is subtle, yet gives these pancakes a wonderful depth. such a nice twist on traditional pancakes. so, go ahead and have yourself some chocolate for breakfast! in a medium bowl, combine the flour, baking powder, baking soda, cocoa powder, and sugar. in a separate bowl, whisk together the buttermilk, vanilla, egg, and melted butter. add the wet ingredients to the dry ingredients and whisk until no lumps remain. heat a lightly buttered griddle or frying pan on medium heat. pour 3 tablespoons of batter onto the griddle for medium pancakes. cook for 3 minutes, until small bubbles begin to form. flip the pancakes when they start to bubble, then cook for 2 minutes, until they are cooked throughout. once cooked, transfer the pancakes to a baking sheet and place in a preheated 200 degree F oven to keep warm while you cook the remaining pancake batter. serve warm with maple syrup. I have not had chocolate waffles since. I had bought that waffle/pancake book for Jeff since he was into making pancakes. You two really enjoyed making many recipes out of that book. That is where the German Apple Pancake recipe came from. Also chocolate chip pancakes were one of your favorites.